Red grapes are nutritious, readily available and easy to eat. This healthy snack adds fiber to your diet, and may also help prevent chronic diseases. Red grapes also help to keep your body hydrated. Freezing red grapes in the summer to enjoy as a snack will help you to stay cool. You can also eat red grapes by adding them to salads and yogurt. Red grapes contain flavonoids, plant-based antioxidants. Foods with flavonoids help prevent development of heart disease. Eating red grapes regularly will help you impede the development of plaque buildup in your arteries, keeping your arteries open to supply blood to all your body's organs. The skins of red grapes also contain polyphenols and anthocyanins, which are antioxidants, notes the National Cancer Institute. These antioxidants work to prevent damage to your body from free radicals that harm membranes and proteins, and also help inhibit cancer development. The lutein in red grapes works to protect your vision. This naturally occurring carotenoid helps prevent macular degeneration, an eye disease that often appears in the elderly and causes serious damage to the vision, notes the American Health Assistance Foundation. 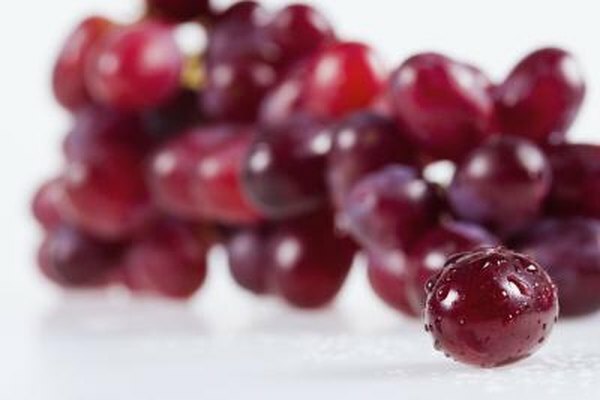 The skins of red grapes contain resveratrol, an antioxidant with heart-health benefits. Consuming foods with this polyphenol helps to lower your blood cholesterol level. The resveratrol in red grapes also works to prevent the formation of blood clots and thus helps to lower your risk of a stroke. Grace Sun, professor of biochemistry at the University of Missouri-Columbia School of Medicine, reports that eating red grapes after a stroke will often help to limit brain damage. The grapes work to absorb free radicals that are released in the brain and harm it after a stroke. Grapes contain vitamins A and C, both of which are antioxidants. Vitamin A helps maintain strong bones and keeps the immune system functioning optimally. Vitamin C supports wound healing and helps your body use iron, which keeps your energy at an optimal level, notes MedlinePlus.